September 14, 2015 – From Thomas Edison to Dr. Egon Spengler in Ghostbusters, the idea of the quirky, driven scientist working in solitude is a popular one in the American imagination. But today, you need big machines like particle accelerators, electron microscopes, and super computers to advance human knowledge. So how did we get from Alexander Graham Bell in his lonely lab to Robert Oppenheimer assembling and leading a massive team to beat Hitler to the atom bomb, or the U.S. racing the Soviets to the moon? Today’s book introduces us to the man behind this revolution, one that touches all aspects of our modern life. It’s called, Big Science: Ernest Lawrence and the Invention that Launched the Military-Industrial Complex . 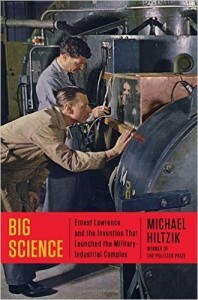 The author is Pulitzer Prize-winning journalist Michael Hiltzik. He’s a graduate of Colgate and the Graduate School of Journalism at Columbia, and has written previous books on the Hoover Dam and The New Deal . You can follow him on Twitter @HiltzikM and visit his website, MichaelHiltzik.com.